Created in 1955 Le Collet d'Allevard is not a large resort, rather a small one. In this resort everybody will find their own rhythm – no matter if you are a beginner or advanced skier, early bird or night owl, thanks to the original ski passes you can ski according to your preferred time. You can be sure that in Le Collet d'Allevard you can enjoy both – skiing in daylight and at the night. With 20 hectares of large night skiing area, this resort will not disappoint those who like to sleep longer. Le Collet d'Allevard’s welcoming and warm atmosphere will keep you satisfied. Le Collet d'Allevard is located in the department of Isère, not far from Grenoble and Chambery and is often used by the local people, who just want to spend a day on the slopes. Le Collet d'Allevard resort overlooks Allevard-les-Bains city. At the Le Collet d'Allevard, you can ski in an open skiing, monoskiing and surfing area. Le Collet d'Allevard is one of the biggest nocturnal skiing areas in Europe. Multiple hotels, bars and restaurants are ready to fill your skiing trip with the best French countryside has to offer. The resort can offer you a kinder garden, French Skiing School, secured sledge piste and snow park. This small and cosy resort offers plenty of summer activities as well, so more adventures are waiting for you if you decide to return here in summer. While train services to Le Collet d'Allevard are available, we recommend you to organise a direct resort transfer from your chosen arrival airport. That is the easiest and most convenient way of travelling to your resort. Anyway, if you will decide to use public transport - Chambéry Train Station is 40 km away (1-hour drive). We always calculate all resort transfer services individually, to ensure that our customers never overpay. Whenever you choose to travel and whatever is your final destination, Alps 2 Alps will get you there for the lowest possible price. However, we advise booking early to access the best possible deal. In addition, keep up to date with Alps 2 Alps for the latest offers, hot deals and discounts on Le Collet d'Allevard resort transfer services. All of the above will only ever result in our base-rate for ski transfers going down – we never over-inflate our prices at any time or for any reason. We also offer substantial discounts for off-peak, off-season and midweek transfers to Le Collet d'Allevard. If looking for the best possible deals, travelling outside peak season or midweek typically results in the biggest savings. We offer midweek (Monday to Friday) prices with up to 60% discount than weekend prices. Your transfer quote will also depend on vehicle availability, transfer schedule, vehicle utilisation and other costs like road tolls and airport parking charges. In all instances, we work hard to keep our prices low and are relentlessly committed to total value for money. Which is why we guarantee you won’t find a better deal on your Le Collet d'Allevard resort transfers, whatever your needs. The resort of Le Collet d'Allevard lies at an elevation of 1,450m, with a max vertical of 650m and its highest lift going as far as 2,100m. There are a total of 18 pistes (3 black, 7 red, 6 blue, 2 green) in the immediate vicinity of the resort, served by 13 ski lifts. Total length is 35km. In Le Collet d'Allevard skiers will find 2 slopes for beginners, 44% of slopes serve the needs of intermediates, 39% are for advanced skiers and the remaining 17% are for experts. Cross-country skiing is not forgotten here – 35km of pistes are created for Nordic skiing enthusiasts. Le Collet d'Allevard is a good choice for those planning a short ski trip or a weekend on the slopes. A great family resort Le Collet d'Allevard is the perfect destination if you are looking for a resort where you could spend ski holidays with kids. 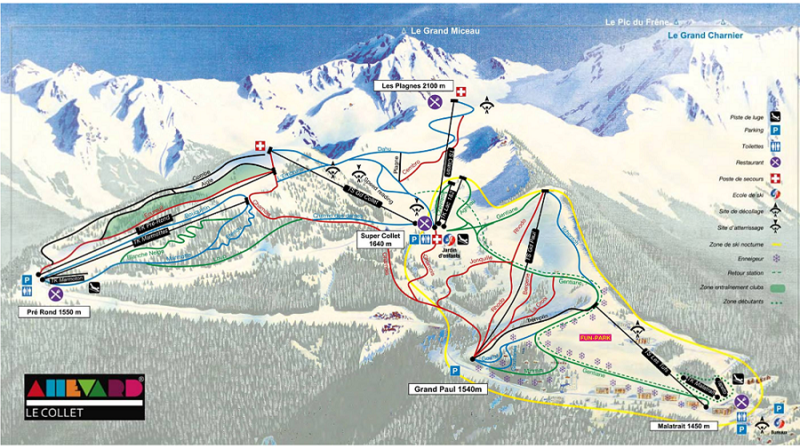 The ski resort offers ski trails for beginners and slopes that zig-zag between the fir trees. Les Tufs ski sector is best for children. Book your trip to Le Collet d'Allevard and have amazing winter holidays! Make sure you are going to get the most out of your trip to Le Collet d'Allevard. Nearby the slopes, Le Collet d'Allevard resort invites you to discover off slope activities including discothèque, cinema and indoor pool. During the day or the night, enjoy the entertainment provided at the resort around its bars and restaurants. Find out more information on the Le Collet d'Allevard official website. Le Collet d'Allevard resort transfers are about so much more than just getting you to your final destination. After all, you also want to arrive comfortable, refreshed and ideally on time. Not all resort transfer services can promise this – Alps2Alps guarantees a higher-level service for every passenger. Make sure you’re getting the best offer and take a look at the deals, discounts and special offers that could make your trip even more affordable. If looking to secure your seats for the best possible price, booking as early as possible is advisable.